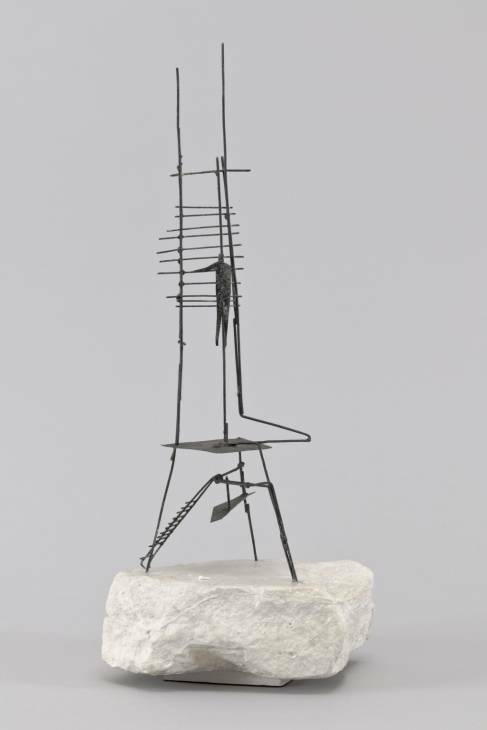 Reg Butler, Second Maquette for ‘The Unknown Political Prisoner’ 1951-2. Reg Butler (Reginald Cotterell Butler, 1913-1981) was an English sculptor. According to Tate website, Butler was a blacksmith who began to sculpt in 1944, without any prior training in art, using welding and later modelling in clay, plaster or wax in order to make his specific thin-shell bronze casts. He rose to prominence during the ’50s and ’60s; in 1953 he won first prize in an international competition for a monument to the Unknown Political Prisoner, which culminated in a working model. Hepworth was a runner-up, along with Mirko Basaldella, Antione Pevsner and Naum Gabo. Although Butler won the competition, his sculpture was never realised and, tellingly, the tribute to the unknown prisoner remained a maquette-based project. What I find interesting is the way these two very different sculptors return to the theme of time and what it takes to make a ‘live image’ in their conversation. Butler’s thought formed during the World War II, of which he was a conscientious objector, and his art of the 50s was very much of its moment: modern, mobile, comparatively fast to make (forged and welded as opposed to directly carved), using human-made instead of natural materials. Most importantly, they are tense reflections of the angst and pressure of modern (post-war) life. They are urgent sketches of unstable conditions and his own fractured belief in discontinuity, or rather, of the ultimate importance of the moment. I like how he uses ‘fugitiveness’ to describe both human condition and the lost wax method in casting (the wax ‘runs’ away). For Butler, a sculpture is ‘a pattern rather than a thing’, ‘a centre of activity, rather than a centre of mass’ and as such closer to painting. For Butler, Hepworth’s carving is very ‘pre- nuclear fission’ and as such, a little bit cosy and indulgent. From her part, Hepworth was consistent in her use of natural materials and in maintaining her interest in a figure in landscape which she considered outside of the social notions of time, but belonging to the world as ‘a tremendous spread in time – something beyond one’s comprehension’: the timelessness of life. Her spirituality (something one rarely reads about when we read about contemporary artists) possibly helped her to maintain that view throughout her life. For Hepworth, her forms are not descriptives of the landscape but forms which express her fundamental sensitivity to her position in landscape. They’re both concerned with human being, but whereas Butler is interested in essential temporality of the human personality, Hepworth searches for the unifying constants. By the end of the 1950s, Butler returned to figurative style, and during the 1960s his work changed both in subject (figurative female) and in speed, each sculpture taking years to complete. Today he is no longer widely known. His departure from his convictions about material and form were perceived as regressive at the time. In contrast, Hepworth stayed true to the abstract forms she was interested in but began casting in bronze, in order to accommodate the demand for larger and more majestic sculpture in space. I feel that they were both at their peak at the time of this conversation, both intellectually and as working sculptors, and it is interesting to me not only how they speak about their process – openly and intently through their differences – but also how public perception and market demand skewed their later output. It’s also been interesting to think about matters of class, how it may have informed their different sense of urgency. 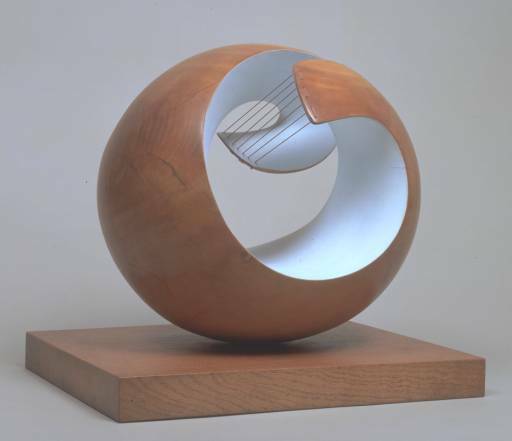 Particular curiosity is that in 1950s every sculptor – Hepworth included – was a hypothetical ‘he’. The conversation below between Barbara Hepworth and Reg Butler took place on 28 September 1951 and was broadcast on 26 August 1952 on the BBC Third Programme, ‘Artists on Art’. It has been reproduced in Barbara Hepworth: Writings and Conversations, edited by Sophie Bowness and published by Tate Publishing, who own the copyright of the text. HEPWORTH: … we were listening to that contemporary music. HEPWORTH: I had – I think it was music which we both rather cared for, but I had a rather curious image of your sculptures stalking in the garden, walking, dancing around solid lumps of rock in my yard, all waiting to be carved, and – but both points of view are so valid and so different that it opened up a whole new idea of sculpture – that is, there’s no limit to the materials one can use, but the great thing is to make this live image. BUTLER: I agree with you. I mean, that is the point of absolutely common contact we have – we’re both trying to make a living image – something that isn’t a substitute for something we met in the world around us – we’re trying to create an image or a thing that lives in its own right – we have different ways of approaching it – approaching the problem. I don’t think the differences are technical so much as that we live, in one sense, in different environments because we see what we – our personalities – enable us to see and we ignore many things which are nevertheless there. Your approach is optimistic, you’re creating forms which are tranquil, remote, linked in some subtle way with antiquity and, to my mind, much more reminiscent of nature in the terms of the sea and the land than the rattle and dynamic of the human being in the 20th century. HEPWORTH: Well, perhaps I am convinced that in this 20th century we shall all become extinct unless we re-stress the living values of what are really primitive instincts in man and are the only things which really keep him alive. And that we shall lose our capacity to live unless we feel at one with all the rocks and the timelessness of life with its perpetual movement and re-birth. BUTLER: Are you talking, when you say ‘we’, about we as artists or all of us? HEPWORTH: All of us as living human beings. BUTLER: Why I ask that is because, to me, that seems to be the thing that makes an artist an artist – this awareness of his surroundings, but the clang and noisiness, the frustration and the anxiety – the fugitive, ephemeral quality of existence for me is just as much a part of nature as the remoteness of sea and rocks – the thing that presses on us, surely, is far more the tension of man-made anxiety than the tranquility of the sea and the stones on the seashore, and the things which, as I see it, are the point of departure for your sculpture. I feel, you see, that your sculpture primarily belongs to an age of greater stability than the one in which I live. I do feel, very much, that the conviction of optimism which comes from cultures which evolve slowly, lends form to the kind of sculpture we associate with ancient Egypt and ancient Mexico, that the sculpture which arises naturally out of conditions in Western Europe today has got to be very different. It’s got to be more tense. It’s got to be a reflection – an intense reflection of the pressure that we feel all around us. Contemporary music, contemporary painting, contemporary sculpture, I see as one manifestation – one temperature chart – of this contemporary environment, and I feel the rocks and the sea, however much we may think how nice it would be to live a pastoral experience in relation to them, we can’t anymore – we’ve lost our innocence. HEPWORTH: I don’t think so at all, and in any case, I don’t think that they’re tranquil. When I go out to try and draw landscape, I never can draw it because as soon as I sit down I immediately become a person in relation to a landscape, a seascape which has endured for hundreds of thousands of years. I have some kind of sculptural relationship to it and the forms I begin drawing then are usually ideas for a new sculpture, that is me in relation to this extraordinary ancient landscape which is completely consistent with sculpture of all times, and I feel sculpture of the future. It may take on a different kind of shape, but its meaning is very much the same to me. And it’s terribly urgent and necessary for us all to be aware of the meaning of form, just as you see in Cornwall a ploughman ploughing round his field – round a stone – he’s fully aware of that stone as a person. BUTLER: But is he? I really doubt that. I mean, I would like to think so – I would like to see all those husky Cornish ploughmen stopping in the midst of their furrow and looking at the stone and saying ‘[Nice] little fellow there’, sort of thing. HEPWORTH: Yes, but you see, I always think when I go to the British Museum that there’s a complete language – it doesn’t matter what period of sculpture one’s looking at – it’s a completely valid language which touches, deep down, our whole feeling, inside ourselves and our whole sense of movement, everything – every gesture – within us, how we stand, the laws of gravity, what it feels like to shake somebody by the hand, so that all we think about this living world in three dimensions, comes out, and we start working. BUTLER: Yes, I imagine all sculptors do that, but what I’m trying to say is that I think the language of today is not the language of ancient Egypt, that it’s a language of tension, a language of fugitiveness and that the sculptor must find techniques to express an entirely different environment from the slow, rhythmic, perhaps cheerful carving of the sculptor in the second Egyptian dynasty. I feel, you see, that all these techniques such as stone carving and wood caving, spring from the cultural environment which is absent today. That the development of more fugitive techniques – the use of plaster, the use of wax, and so on, hasn’t come about purely from the cleverness of invention but is a symptom of the world in which we live. HEPWORTH: But I can’t see – you haven’t explained to me why – an image in stone is less valid than a plaster or a metal ephemeral object, as you call it, we are still human beings, we still desire to go on living, to have our homes, to feel moved by the landscape, to feel that we’re going to have our feet on the ground and not be shot off into space. Why is one more valid than another? BUTLER: The kind of confidence, the kind of constant social pattern which was characteristic of slower moving cultures, I feel bred the techniques of carving. One could devote thirty years to the carving of a head in a very hard stone, because in a sense the aesthetic criteria which operated when one started on that work were still in operation thirty years later, but this is – this civilisation in which we live is one of flux, complete change, complete interpenetration of forces from all directions, and I feel that the works of contemporary sculptors, such as Giacometti, are an example of the reflections of that state of mind. Now, I know that an artist can either, as it were, work with his environment or, as it were, in direct opposition to it, and I think a lot of the appeal, for instance, of your work, and Moore’s work, lies in this reminder of roots in which our particular species has its birth – this reminder of our continuity with the past. But I feel that reminder has been achieved – we are reminded of that – we can’t go on reminding ourselves of that – it doesn’t help us out of our difficulties. HEPWORTH: I think it helps enormously – I think one has to go on reminding oneself for ever and ever that the world is a tremendous spread in time – something beyond one’s comprehension. The most tangible and lasting thing like rocks and sea and land are the things out of which life sprang and life can be maintained, and I can’t see why carving is any more important in one era than another because it’s a perfectly natural medium, it’s a perfectly natural feeling to wish – to take a rock and turn it into life and to make, in that way, an image which has a magic to preserve life in one’s own personality. I like your work because it walks about the place – it is a live image and it’s true to the medium, it’s wonderful metal, the way it’s made, I like its craft, its vitality. But it doesn’t mean to me just 1951 and the disturbed life, it means to me the extraordinary confidence in living things. BUTLER: Well, I’m glad you feel that way – I wish I could feel that way myself. I don’t, and I tried to explain why. HEPWORTH: Don’t you long to put something there – contribute something which would go on and on and on past yourself? HEPWORTH: But we all are, because we cannot possibly live now without reading the newspapers and knowing what is going on, in fact, we know everything, we’ve got to digest it as best we can and still go reiterating these constant values. BUTLER: The constant values for me are the facts of existence. The facts of existence in one kind of world or another kind of world. The reiteration of the facts of existence which are a common point between us and ancient Mexico for me aren’t very exciting. I don’t feel that they are the things I want to say. I agree with you that it would be very nice to live in a tranquil, pastoral civilization. HEPWORTH: I don’t think anyone’s lived in a very tranquil, pastoral civilization. I think that those times, that each time of living people must have been beset by the most urgent and terrifying problems. Ours are different because there are an accumulation of these problems – but we’re still human beings with very definite reaction to human beings moving about this world and living and dying and as sculptors we want to say something about it and make our image. Also, as sculptors, we know that all these three-dimensional forms, these symbols which touch human beings in a way that words and music and colour cannot do, they are terribly real – as real as when a child starts feeling and walking about and finding that things have a solid substance. BUTLER: I know what you mean, at least I think I do, but you see, for me we aren’t made of solid substance. The concept of solid substance ended with the end of the 19th century. We no longer see ourselves as masses in space. We are a mere interplay of patterns – we’re something much less permanent, much less important perhaps in the world, in the universe, than we thought we were, and I feel that contemporary developments in space – in space in the sculptural sense, this interpenetration of outsides and insides, this denial of the value of mass, as such – is part of this whole problem of awareness of the world in which we live. In science, in physics particularly, the concept of unbreakable elements constituting matter has broken down completely now – we live in an age in which the concept of fission, of the smallest particles of matter as matter is a day-to-day awareness. HEPWORTH: Well, would you then all sculpture be kinetic sculpture – why have the more solid properties of stone or wood become invalid? It seems to me that it’s the idea that matters, not the material. I think sculpture can be expressed in absolutely any material. BUTLER: I think there’s a right material for any particular kind of ideas, and I feel that a sculptors life is the search for that right material. HEPWORTH: Oh well I would agree there, that each one of us chooses the material which will fit an idea. One might move from one material to another, but I don’t see how you can say that certain materials are not valid any longer. BUTLER: Well, I feel all those materials which involve slow, steady, as James Stephens might say, ‘loving chipping’, belong to an age when that was an appropriate activity. One lives in a tumult of grinders and welders and roaring fires and a kind of manifestation of anxiety through life. HEPWORTH: I don’t think it’s any more anxious than moving great rocks and trying to make them stand up and come down again, or making a hole right through, making a hole right through a stone so that you reveal its depth and its inner tension, and the space in relation to a human being, is just as exciting from the inside point of view as building up a form with its spaces, or making a kinetic sculpture in which new forms are created, as it is twirled round by the slightest breeze. BUTLER: Well, you’re quite right to say that it is exciting to you – for me I can only say it isn’t, and you’re rather more broad-minded than I am because I’m, as it were, trying to generalise from my own experience, which is an unsatisfactory thing to do anyway, but I feel that it’s wider than my own experience, that there is something essentially contemporary about the hollow form, about the form which has no surface in the accepted sense of the word. The form which in point of fact does not exist except in relation to the things it suggests. You see, as a sculptor, I’m not interested in making things, I’m not interested in the process of finishing an object – a magical object. The best I can do to explain myself is to say that I try to create a personage. Now a personage for me is a rather intangible something – a pattern rather than a thing. A centre of activity, rather than a centre of mass, and I think that’s as far as I can go in explaining why for me the solid object, the impervious object, doesn’t belong to the world in which I live any more; it’s pre-nuclear fission if you like. Your approach to form, the carving off of surfaces, the shaving down of surfaces, the cutting through of holes, and so on, reproduces much more the process of time and weather and volcanic movement of earth, and so on, than the technique which I seem to have grown into and which I use, as I see it, for much more personalised images. HEPWORTH: No, I don’t think really that my shapes are formed because of the wear and tear of the elements. I think they’re more the sort of forms which express my fundamental sensitivity to my position in landscape. If I stand on a cliff, say at Zennor, and look at the most extraordinarily turbulent sea, I am, as a human being, extraordinarily frail but related to that form of landscape and everything which the sea is doing and has done to it, and I have then a series of reactions – emotional reactions – which produce an idea of a shape – not just sea-worn shapes, but the kind, if I felt with my eyes shut, which would evoke my very human feeling about it. It’s not quite the same thing. BUTLER: No, I’m sure it isn’t and it’s very difficult to find a verbal explanation for somethingw hich can only justify itself, by itself. HEPWORTH: I want very much when the sculpture is done for it to conjure up again all that I felt in a particular place in time, in relation to my surroundings. BUTLER: Yes. But that is really what I mean, in other words, place. BUTLER: Place and time are important elements, more important to you than to me, and in the same way person and personage is perhaps to me the most important thing. HEPWORTH: Yes, but if – A landscape to me hardly exists without a human being in it. BUTLER: True, I think that’s characteristic of all sculpture. HEPWORTH: The minute the human enters everything becomes ordered in its exciting volume and scale and gesture. HEPWORTH: And it is really man’s relation to landscape and time in history that matters to me. But the rocks I choose or the wood I choose is merely because I happen to like chipping bits off rather than using a welder. BUTLER: No, no, I don’t agree. BUTLER: No you see, I think that your sculpture is very often more a sculpture of landscape than it is a sculpture of a person. HEPWORTH: It isn’t a landscape – it’s me in the landscape. BUTLER: No, I’m not quite sure what you in the landscape means, because it’s a nice phrase but rather difficult to understand completely. I mean, there’s not quite that complication with my own work in – as far as I can see it, because the majority of my sculptures are people, many of them individual people or types or individual things like that. HEPWORTH: Well, I feel that in sculpture or anything else the excitement of the individual is just as exciting as the properties which are constant throughout all individuals. For myself, on the whole, I like to find these constants because those are the things which I like seeing again ten years hence rather than the individual – that is just for myself. HEPWORTH: With a magical constancy. BUTLER: – general pattern doesn’t it? HEPWORTH: Yes, I think I’m always amazed by the persistence of life. HEPWORTH: But I still cannot understand, if you apply your ideas, stone not being a valid medium for this present life, I can’t see what – how you’d develop it in relation to architecture or our form of living. BUTLER: – at various times historically, it has fused with the architect’s intention and has produced buildings of great beauty and meaning, but I don’t think that sculpture is approachable other than as sculpture. HEPWORTH: I’d agree there – I don’t think it is approachable in any other way because I think it touches a whole world which is quite different to architecture. I think it’s a sort of introduction to architecture. It’s a link between man and his surroundings. I always feel that sculpture outside a building conditions man to his position in the landscape, his position in relation to the architecture in which he’s going to enter, and as such it’s tremendously important in relation to architecture, but never as a decoration or as an addition, and that’s why I think that sculptors and architects should get together to work out the proper spacing and the proper placing of sculpture. BUTLER: I think it would be a nice idea, but I think it’s rather unreal. I think the sculptor, like the painter today, is concerned with his inward eye. I don’t think his approach is conscious enough to make him a good element in an architectural team. I think that may come, and I hope it will come, but for the moment I think the sculptor is concerned, just as a painter, like Sutherland, is concerned, with the problem of releasing these demands which he feels about him, and using his technique, his mechanism of sculpture, as a way of doing that. It’s his way of being vocal, it’s his way of commenting on what’s going on, and I think we may move into a period in which a natural co-operation may spring up between the production of buildings and the production of sculpture. I think there are signs of it [– I think architects have got] through this castor oil period of stripping their buildings down to the barest fundamentals and reconsidering design from the beginning again, and I think architects are showing an increased interest in the other visual arts, but I don’t feel that the sculptor can worry overmuch about that now, I think his job is with his sculpture in his studio. If he starves as a result of that, well, it’s too bad, but that is where it is – as I see it. BUTLER: Oh no, surely not. HEPWORTH: I think every sculpture that’s made must have some relation to a place. I don’t think you can make it in a vacuum – at least, I can’t. It always has some kind of position in the landscape or in architecture, in one’s imagination. BUTLER: Well, I think that is part of this solid approach as it were, this conception of a piece of sculpture being primarily a thing. I regard sculpture as being something closer to painting which, as it were, creates its own environment within its own terms, and I feel that it may well be a very long time before we see sculpture which has the kind of relevance to architecture that we associate with Renaissance and Egyptian and Mexican periods of development. I feel there is such a difference that sculpture today stands in relation to the human experience in much the same way as painting has almost always stood, and I feel that the problems that faced a sculptor in his studio are the problems of sculpture, and although his natural interest in space will always ensure that he does think of his piece of sculpture in relation to masses around, it’s very likely to be his own studio. In an odd sort of way, you know, I think the activity of sculpture is the activity of filling one’s studio or of making in one’s studio something that the mass and shape of one’s studio demands.